The Y.O. 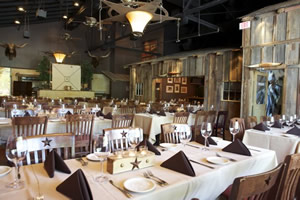 Steakhouse is one of the best locations in Dallas to host just about any type of event: meetings, parties, wedding rehearsal dinners, and wedding receptions. Whether it is a intimate get-together, or for several hundred guest, there is little the Y.O. staff can’t handle. Lodges at the Y.O. Steakhouse feature a private entrance for guests attending to weddings, or wedding rehearsals. Having a wedding at the Y.O. is an ideal western wedding with authentic Texas decor. The wedding lodges accommodates up to 300 guests. Weddings at the Y.O. Steakhouse are always treated with the up most respect and undivided attention. The Y.O. provides a staff specialized with organizing weddings, and creating the perfect western wedding. Private dining menus can include hors d’oeuvres, full bar packages, lunch items, or dinner items. Leave an unforgettable impression for your guests with a western themed wedding that doesn’t just features amazing, juicy, food but also a great staff, and an amazing venue. The Y.O. also offers entertainment for guests like video presentations, and music. Like the food, beverages at the Y.O. are varied from pre-arranged options that are served from a private bar for the rehearsal dinner or wedding.